Booster is simple, minimal, lightweight, fast loading, SEO friendly stunning, and efficiently coded free business HTML5 Bootstrap landing page template. It’s high conversion optimized, incredibly aesthetic and professionally curated, combined with all visual elements that boost your conversion rates and maximize your goal, rather than concise style choices. The Booster is best for anyone those who want to promote their business ideas and services comprehensively and collect some leads to promote their product and services directly. With current connect arrange, it can tailor with various website purposes including professional service promotion like online courses, professional expertise, health, startup, web app landing, real estate, travel agency and other skill-based services such as web development, SEO consultancy and more. 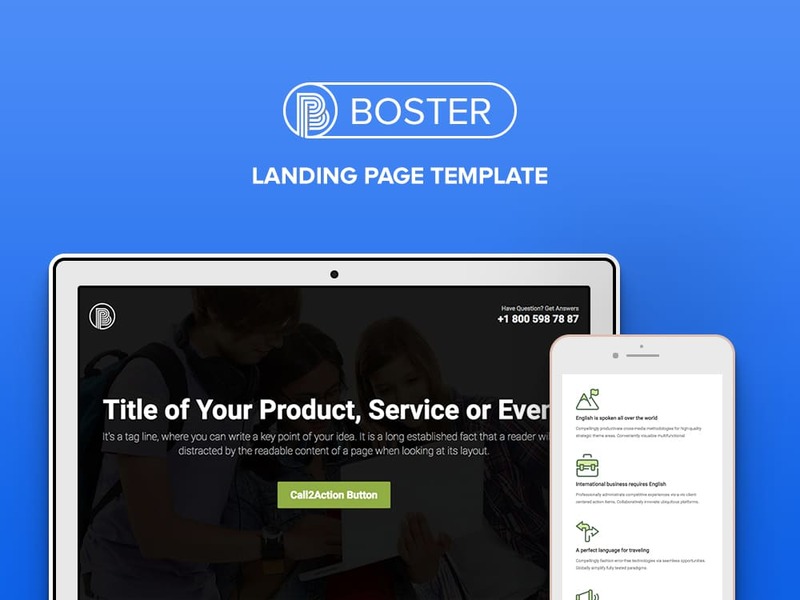 To demonstrate how much Booster is helpful for a business landing and combines all the best practices and remarkable elements of landing page anatomy, go through the key points of high converting landing pages. Above the fold is such a section of a website where visitors land the first time and start exploring website contents. It can be termed as Hero area. So, Booster offers a streamlined, straightforward, striking above the fold which extensively invoke users to click on the call to action and perform the webmaster’s desired actions. In landing pages, it’s essential to convey the business mission, purpose, and crucial message at once. When it comes to convincing visitor through landing, you got minimum 3 seconds. 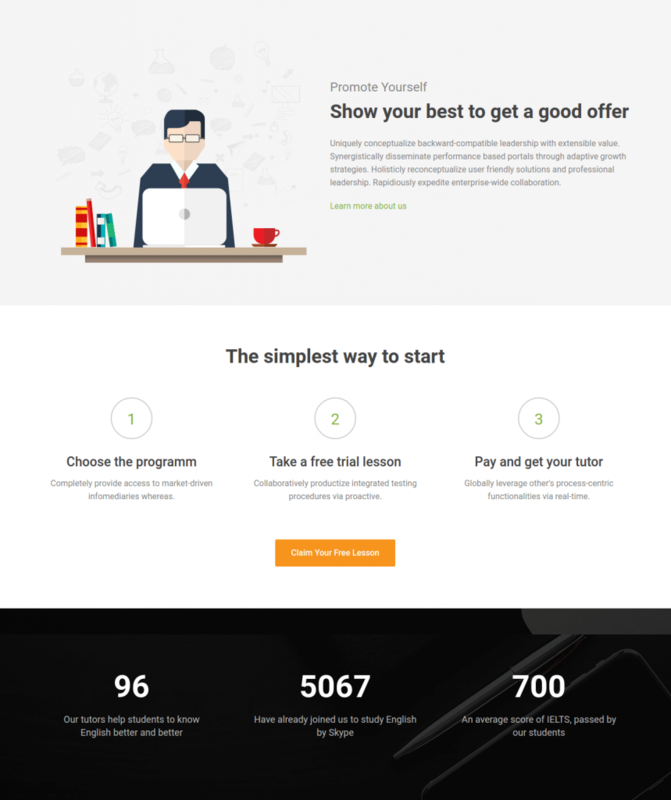 So, Booster free corporate HTML5 Bootstrap landing page template offers intuitive and engaging headers and subheaders to deliver the business motto conspicuously. It’s the crucial part of the business funnel. When visitors get convinced, it’s now time to capture their leads or redirect them to pricing pages. So, like Booster mobile friendly Bootstrap landing page template comes coupled with high intriguing call-to-action button which can easily enchant visitors and push them to funnel just after triggering the button. When call-to-action button is triggering the signup form, it’s best not to include any loaded text or other funky elements that can become the reason of confusion or distraction. Leave as it is. 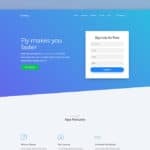 The best HTML5 responsive Bootstrap landing page template keep the signup form normal like traditional email input form and simple Subscribe or Sign Up Button. It performs the best. 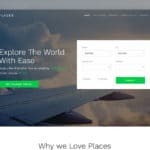 When it comes to a landing page, it’s mandatory to demonstrate and answer the user’s questions like “What’s in it beneficial for you?” The message cities on a website to persuade customers which must look amazing, clean, minimalist and mind blowing so that it can quickly convey it selling and important business message perfectly. 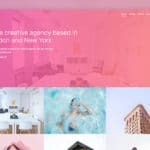 So, when you have Booster simple one page bootstrap landing template in the bucket, you don’t need to worry about anything, it decorates each section elegantly so that you can tell your business story eloquently. The best performing HTML5 responsive Bootstrap landing page templates come constructed with the logical arrangement of business contents. It helps customers to cognitively engaged with your landing website. If you are only spending time making the look of your landing page template enchanting, spend some time to maintain the content flow. As the success of maximum high converting landing pages is measured based on the high rate of CTR, you have to focus on the arrangement. Like the first start with the explanation, head forward with benefits, include testimonials of satisfied customers, and end up with attractive Call To Action. The incredible way and proven way to convince a customer, considered one of the most remarkable and credible trust signals, that convince customers. Such section performs extremely incredible when it combines testimonies of celebrities and experts. To kick-in your such business strategies, Booster free twitter bootstrap landing page template combines exquisite testimonial slider. It adds the photo, name, designation, and a short description of testimonial givers. 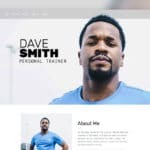 Booster is clean, visually enriched, profoundly resourceful, luxurious, polished, entirely stylish, and probably the best professional best free Bootstrap landing page template, crafted with modern technologies that give everything that you need to develop a minimalist landing page website. The features are following. 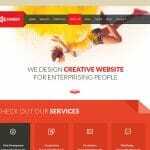 Booster, the free Bootstrap 3 template has ground up on the base on modern technologies. HTML5 describes the skeleton and sketches of this awesome website theme, whereas CSS3 controls all styling and animations comprehensively. 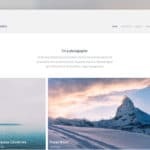 The frontend framework assures bootstrap grid systems, bootstrap carousel slider, bootstrap modal window/signup popup, Bootstrap buttons and more. To let your fantastic content to tell the stories and keep your customers engaged until the conversion, the modern one page responsive Bootstrap landing page template has kept everything on the single page so that visitors don’t need to click to view any content and elements. As the technologies of website viewing devices are unimaginable and unmatched, you need to cover everyone with single landing page theme. So, Booster is constructed with meticulous codebase which can easily adapt inside the iPhone, iPad, Tablet, Feature Phone, Smartphone, Windows Phone, Android Phone, wearable devices high-resolution displays, and more. In the new era and evaluation of the internet, people seldom wait for a slow website. Statistics shows, people quickly abandons the landing page website which fails to load within 3 seconds. So, Booster comes combined with the lightweight and blazing fast codebase, event not included with fuss and unnecessary elements which make it fast loading bootstrap landing page template. Booster can appear in any devices within 2 seconds. As the codebase of Booster is efficient and loading within 2 seconds, it can be termed as SEO friendly Bootstrap landing page template. We, the developer combines all possible aspect of SEO that helps major search engines like Google, Bing, Yahoo, Baidu and others to quickly rank your landing page website. Browser support is essential when it comes to landing pages. As the behavior of viewing devices is unimaginable, tracking the browser visibility is elusive. So, the cross-browser compatible Bootstrap landing page template has tested over Google Chrome, Mozilla Firefox, Internet Explorer, Microsoft Edge, Safari and more.